3G, camera and microSD slot, what more do you need? As with the 105, the Nokia 301 will likely do very well in emerging markets, but with the advent of low-cost and feature packed Android handsets in Europe it will probably struggle to break through. It's a a backup device, perfect for festival trips or emergency situations. The Nokia 301 is bringing a simple, affordable mobile phone experience to Europe as the Finnish firm looks to hone in on the companion device market. While the 301 will be sold in emerging markets as the primary handset for users, in developed regions this feature phone won't be on children's Christmas wish lists. Set to touch down in Europe during the second quarter of 2013 the Nokia 301 will be priced at a reasonable 65€ (around £56), although it's worth noting the Android-equipped ZTE Blade 3 will only set you back £70. There's currently no word on whether the Nokia 301 will make it to stores in the UK, and we wouldn't be surprised it British networks decided against carrying the handset. In terms of looks the Nokia 301 borrows styling from the firm's Lumia range of smartphones, with rounded corners, minimalist design and a colour palette which is now well known. You'll be able to snap the Nokia 301 up in the standard black and white variants, or if you're feeling a little more adventurous you can also choose from cyan, yellow and magenta. There's no touchscreen on the 301, instead you get a low resolution 2.4-inch display which sits above the classic 12-button keypad and menu keys, giving the handset a proper retro look and feel. On top is a 3.5mm headphone jack and microUSB port, while down the left hand side there's a covered microSD card slot. The plastic cover is easy to whip off and clip back in, and if you plump for the dual-SIM Nokia 301 on the opposite side you'll find a similar setup for the second SIM card. Like its cheaper brother, the Nokia 105, the 301 is noticeably plastic in the hand, but it does feel pretty solid and capable of taking a few knocks. The second SIM slot is only good for 2G connectivity which means internet access is out of the question, but the main SIM slot, located under the easy to remove plastic rear and battery has support for the 3.5G network. Nokia promises a great imaging and internet experience on the Nokia 301, and has added some additional features to the camera app on the handset. 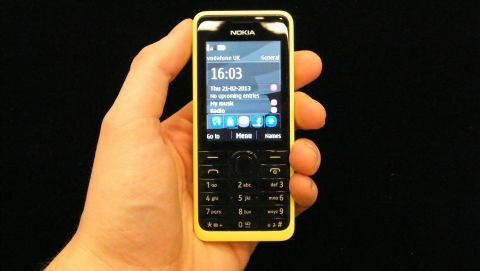 The 3.2MP senor round the back is acceptable for an entry level device and as well as being able to take standard photos Nokia has also added panorama, burst and self portrait modes to the 301. It's the self portrait mode which piqued our interest as the Nokia 301 will give you verbal instructions (up, down, left, right and ok) to ensure your cheeky mug is in the centre of the image. The technology works remarkably well, although you'll need to be a little patience as the feature phone processor housed inside the Nokia 301 isn't particularly powerful, or quick. There's no flash on the 301, so you'll need to ensure you're in a well lit area before you start snapping away. In terms of internet browsing you're not going to get the same experience as you'd find on today's smartphone, with the 301 coming equipped with Nokia's Xpress Internet browser. This delivers compressed websites stored in the cloud to the handset, which cuts down on the amount of data which needs to be transferred, and also helps the processor inside the Nokia 301 cope. To aid browsing Xpress Internet offers up a homescreen of quick links to favourites such as Facebook, Twitter and YouTube as well as content tailored to your location. It's not a particularly quick way of browsing the web, but at least it's functional and allows you to do the basics. There's support for Mail Exchange so you can keep up to date with your emails as well as sync contacts and calendars, plus Wi-Fi is also onboard which will give your mobile data allowance a break. HD voice support means that call quality should be excellent on the Nokia 301, as long as your network supports it, while onboard Bluetooth allows you to share content easily between other Nokia devices which have the Slam Share app. Slam Share is very much like the Bump app some of you may be familiar app, and sees you "slam" your phone against another compatible handset with the motion initiating the file transfer via Bluetooth. The easily accessible battery hidden under the rear cover will apparently give you up to 39 days of standby before it requires another charge - which makes the Nokia 301 an ideal choice if you're going to be away from a power source for an extended amount of time. As with the 105, the Nokia 301 will likely do very well in emerging markets, but with the advent of low-cost and feature packed Android handsets in Europe it will probably struggle to break through. If you're looking for a low cost handset you can pick up an Android smartphone for under £100 these days which offers vastly more features than the 301. The Nokia 301 is a back up device, perfect for festival trips or emergency situations but it will never have the same appeal or desirability as today's smartphones.